NYC Dems draw a contrast with Bloomberg on housing. But can they deliver? This past weekend, at Al Sharpton’s invitation, an all-Democratic cadre of New York City mayoral candidates spent the night in the Lincoln Houses housing project in Harlem. Aside from offering a rare opportunity to see seasoned politicians in casual attire (ex-Rep. Anthony Weiner, in shorts and a polo, settled for a happy medium between his usual public ensembles of either suit and tie or… oh, forget it, it’s too easy), the event brought some attention to the state of the projects in one of America’s last major cities to still have them. And though it was derided by some as a publicity stunt, it also offered a reminder of the Bloomberg administration’s record on this particular issue, and the uphill climb the slumber-partiers will face if given the opportunity to act on their campaign promises. 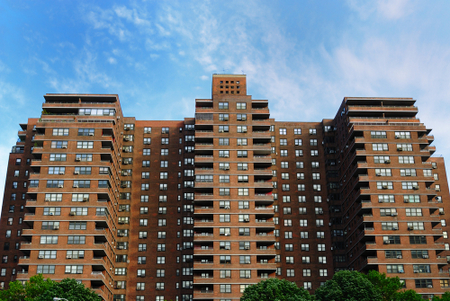 The general consensus in urban America is that public housing, once idealized as a pillar of the social safety net, became a financial and humanitarian disaster by centralizing poverty and causing it to fester in perpetuity. Chicago, Baltimore, St. Louis, and other cities have dynamited and redeveloped public housing units after the projects became synonymous with urban blight. In New York, however, half a million or so people are still living in old-school projects, a reality that the candidates confronted this weekend, however briefly. The man they hope to succeed, Mayor Michael Bloomberg, who himself owns eleven homes, has defended the New York City Housing Authority (NYCHA)’s continuing commitment to its mission even as other cities are “walking away from public housing,” but his policies over the past 12 years hardly reflect that rhetoric. “A ridiculous disgrace,” wrote Gawker of Bloomberg’s record on housing in its 2009 non-endorsement of his reelection campaign, citing the inability of the administration and its partners in the private sector to follow through on extravagant and quasi-utopian promises that rezoning various areas of the city would incentivize the development of scads of modern affordable housing even as rents skyrocketed citywide. Since then, John Rhea, Bloomberg’s Wall Street-pedigreed NYCHA chairman, has been perceived by on-the-ground advocates for housing reform as the “well-dressed executioner” of public housing in New York, and has faced harsh criticism from at least some of the mayoral hopefuls who attended the Sharpton sleepover. Bloomberg’s administration may not be actively walking away from public housing, but it certainly has its back turned, offering the Democrats ample room to differentiate themselves. As a former affordable housing advocate, current City Council speaker, and candidate with the most suspiciously cozy relationship with Bloomberg in the eyes of liberal primary voters, it makes sense that Christine Quinn has been the most outspoken candidate on housing issues, and also the one with the longest record. Her campaign site features a list of accomplishments on affordable housing development and tenants’ rights, many of which were achieved in concert with the mayor and some of which attempt to highlight their differences. One such difference: the centerpiece of her housing proposal is a cap on real estate taxes for landlords, which she says would encourage them to maintain affordable, below-market rates for tenants. But even Bloomberg criticized a version of the idea from a few years ago as having been written by and for the real estate industry at the expense of tenants and taxpayers. Quinn says the current proposal is more tenant-friendly and affordable, but concedes that the idea came from her supporters in the real estate industry, whose interests she contends are not necessarily mutually exclusive with tenants’. Quinn’s website offers details on a number of other proposals, but makes no mention of the NYCHA problems—like the agency’s inability to address basic problems of cleanliness and functionality—that she highlighted after her visit and has declared at mayoral forums as warranting “soup to nuts overhaul.” As she places her trust, and the emphasis of her campaign, in the real estate industry to be the key player in finishing the affordable-housing expansion that Bloomberg halfheartedly started, it is hard to see where meaningful reforms of the experiences she spent one night tolerating would find a place in a Quinn administration. The other sleepers-over, former comptroller Bill Thompson, current comptroller John Liu, and public advocate Bill de Blasio, increasingly look like also-rans in polls. They’ve also been the fiercest critics of Bloomberg—and Quinn and Weiner—on social-justice-oriented issues like housing. De Blasio, for example, says that Bloomberg/Quinn-style development incentives need to become “hard-and-fast rules” if they are to be successful, and has proposed a “dedicated workforce drawn from public housing residents” to advise his administration on how to repair NYCHA and “make our public housing the pride of our city.” In his campaign and over the weekend, he has drawn attention to the “notorious” wait times for repairs that afflict NYCHA residents. But before he does anything about it, he first needs to get the job—and with his numbers mired around 10% while Quinn and Weiner are solidly in the 20s, that looks increasingly unlikely, unless the latter’s numbers take a dive in the wake of Weinergate 2.0. Ditto Thompson and scandal-tainted WTF candidate Liu. For the front-runners, then, paying lip service at the sleepover could be a no-lose situation: they get some progressive, anti-Bloomberg cred without having to include much in their platforms that address an issue that admittedly few are eager to talk about. The question is, for a Mayor Quinn or Weiner, which public stance—the photo op, or the platform—will prove a more accurate gauge of their housing policy? And whichever way they go, will the potential first Democratic New York mayor in two decades outperform the predecessor whom, for now, they can’t criticize enough? Ben Florsheim is an intern at the Washington Monthly.